Several scientific researchers and doctors have shown the health benefits of walking. They have shown that walking is good for your heart, lungs, muscles and bone growth, and it's also good for your well-being. Strong scientific evidence now supports the many health benefits of regular walking. A treadmill walking exercise can prevent osteoporosis. Simple treadmill walking does wonders for maintaining bone mass, because it is a weight bearing device that provides the additional benefit of impact at foot plant. Our bones need exercise to stay strong, no matter your age. Exercise can also help you minimize bone loss and prevent other health problems, such as diabetes, high blood pressure, cholesterol, obesity, and many other diseases. Scientific researchers and doctors believe that regular exercise, such as treadmill walking three to four times a week, is effective for the prevention and management of osteoporosis. 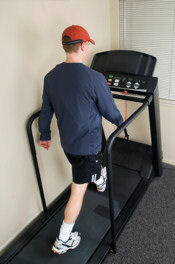 Exercise, such as treadmill walking, outdoor walking, aerobic and others, prevents risk of developing type two diabetes. Studies have shown people who are physically active have less of a chance of developing type two diabetes, than people who are not physically active. Regular exercise enhances the body’s ability to use insulin. Insulin is a hormone that regulates the use of blood sugar, which helps maintain normal blood sugar levels. Regular exercise with a healthy diet can prevent the risk of developing coronary heart disease. Regular exercise can have a positive influence on many of the factors that increase the risk for heart disease, such as obesity, high blood pressure, high cholesterol and diabetes. A study conducted by the researchers at the University of Illinois, for a duration of six months, observed 124 volunteers, aged 60-75. These people were allocated for different exercises; half were given an aerobic program, which consisted of stretching and weight lifting. The other half were given a walking program. The walkers were able to complete an hour long loop around the university campus, three times a week (the walker participants were not exercisers before joining the program). The outcome of the study was quite intriguing. It turned out that walking provided not only a good workout for the body, but also for the brain. Both memory and judgment were sharpened in the walking group. Brain functions known as “executive control processes”, which are located in the brain’s frontal and prefrontal lobes, and have the ability to plan one's behaviour to achieve a goal, were enhanced in the walkers group. A scientific study presented at the American Heart Association’s 2006 annual conference, showed that moderate walking can make old blood vessels act like younger ones. According to biological changes in our body, when we are young, our blood vessels easily dilate and constrict as needed; but as we age, our blood vessels become less compliant. Dysfunction in the ability to dilate and constrict contributes to atherosclerosis and the risk of heat disease. The study consisted of 14 older men and 14 younger men. At the start of the study, scientific researchers measured how easily the men’s forearm blood vessels dilated and constricted after being injected with various chemicals. The researchers then assigned 8 of the 14 older men to a three-month exercise program that consisted of walking 55 minutes a day, on five days per week. After three months, when these older men were challenged with the chemical injections, their blood vessels responded like those of the younger men. Treadmill Trainer is the number one treadmill workout program for all treadmill users. It is a Mp3/Ipod workout, so you can simply plug in your headphones and workout. Treadmill trainer is like having a mini, personal trainer in your headphones, guiding, motivating, encouraging and helping you every step of the way, to achieve your fitness and weight loss goals. It is one program all treadmill users should have. Treadmill trainer is recommended by consumers and most fitness experts. Yuri Elkaim is Canada's top trainer, and the creator of treadmill trainer. Get your very own copy of Treadmill Trainer HERE.